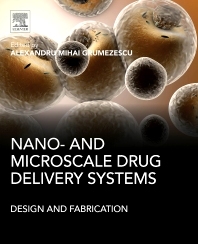 Nano- and Microscale Drug Delivery Systems: Design and Fabrication presents the developments that have taken place in recent years in the field of micro- and nanoscale drug delivery systems. Particular attention is assigned to the fabrication and design of drug delivery systems in order to i) reduce the side effects of therapeutic agents, ii) increase their pharmacological effect, and iii) improve aqueous solubility and chemical stability of different therapeutic agents. This book is designed to offer a cogent, concise overview of current scholarship in this important area of research through its focus on the characterization and fabrication of a variety of nanomaterials for drug delivery applications. It is an invaluable reference source for both biomaterials scientists and biomedical engineers who want to learn more about how nanomaterials are engineered and used in the design of drug delivery nanosystems.